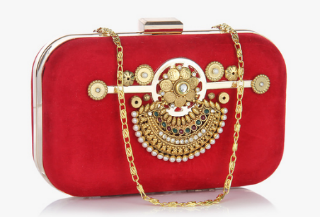 8 Super Pretty Clutches For The Bride’s Trousseau! Among the mad rush of wedding shopping, there are so many decisions to take. And among the lehengas, sarees, shoes, jewellery and makeup, don’t forget to pick the right bag for each look. After all, shoes and bags are the finishing touches that can take your look from ‘good’ to ‘wow’. 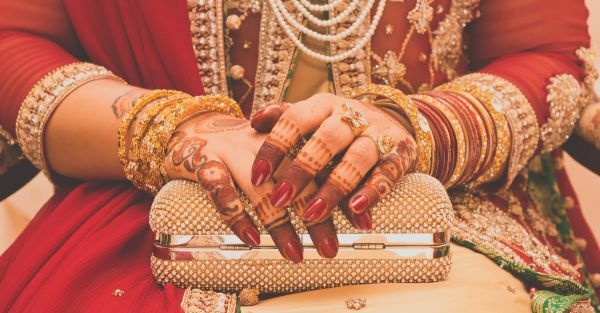 To make your life simpler, we’ve put together a list of gorgeous bridal clutches you must have in your trousseau. This bold red clutch immediately caught our attention. After all, who can resist that most bridal of all colours - red. It’ll go with your bridal joda, we’re sure. Plus, the kundan work is so shaadi! Price: Rs 3,000. Buy it here. 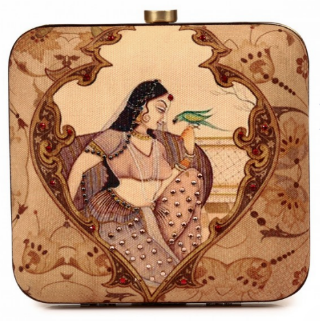 If your engagement outfit is inspired by Deepika’s Bajirao Mastani look, then you need this Mughal miniature painting inspired clutch. It’s so sophisticated and romantic at the same time! Price: Rs 3,400. Buy it here. 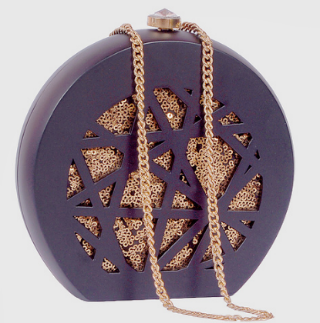 The unusual shape of this clutch immediately sets it apart. This wood black and gold clutch will go well with your Indo-western outfits, or with the princessy gown you have earmarked for the reception! Price: Rs 4,410. Buy it here. We love pearls in our jewellery - after all, they are so classy. 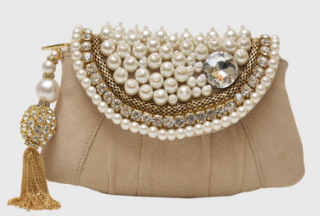 So how can we pass up on this beautiful, pearl-encrusted clutch? It will add that ‘dressed up’ vibe to any shaadi outfit. Price: Rs 5,599. Buy it here. Opting for a chilled out, bohemian look for your mehendi? This colourful fabric clutch is all sorts of cheerful and will add a fun vibe to your outfit! Price: Rs 999. Buy it here. We’re sure you’re opening a bottle of bubbly at the reception. 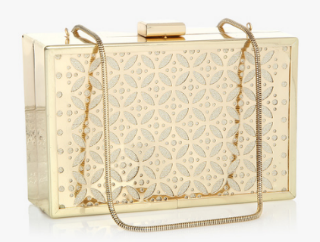 And this champagne-gold box clutch is the perfect foil to your reception gown. The colour and the laser-cut panels are will add a dash of sophistication to your look. You’re welcome! Price: Rs 2,520. Buy it here. The green, thread-work parrots are just so cute! And this pair is such a great symbol for your love. We love the green-pink-gold combo of colours along with the unusual cylindrical shape of this clutch. Price: Rs 1,495. Buy it here. 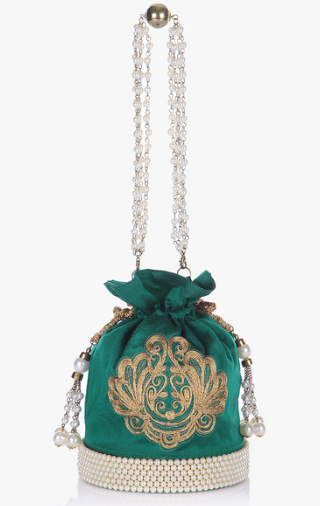 No wedding trousseau is complete without a potli bag in it! After all, they are one of the most versatile bags around and they are just so appropriate for a shaadi. The structured look of this potli along with the deep emerald-green colour will elevate you to royalty level immediately. Price: Rs 1,800. Buy it here. HAVE A STORY IDEA FOR POPxo? If you want to hear about it, we can write about it! Just tell us your idea here! MUST-READ: 6 Clutches That Actually Carry ALL You Need At A Party! 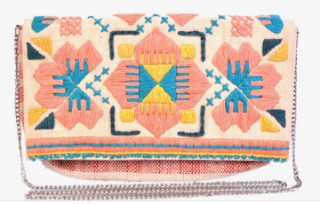 MUST-READ: Look WOW With These 9 Fab Clutches!